Add panache and pizzazz to your presentations with the AdirOffice Acrylic Podium Lectern. Speakers can make their positions clear from a position of power, while keeping things organized and running smoothly. This stylish podium is ruggedly designed using ½-inch, acrylic plexiglass material to furnish long-lasting strength and use for years to come. Even though acrylic is lightweight, it boasts great strength and is shatter-resistant. It won't break even if it hits the ground, and effortlessly shrugs off point-making pounding when you become passionate about your topic! Its sleek, swept-back modern design will seamlessly enhance any interior space, plus it suggests that presenters are keeping up with the times regardless of what they are presenting. Moreover, you can refresh yourself or your memory utilizing the handy, built-in beverage and note shelf. Boasting a 47-inch height and a generous, presentation surface, this sleek podium will deliver a professional look anywhere it’s used. The generous, lip-equipped surface prevents papers and books from sliding, keeping your notes in place when reading so your presentation goes off without a hitch. Meanwhile, the large base provides stability and is outfitted with four rubber feet to protect floors from scratches and unsightly scuff marks. This attractive, durable podium is ideal for use in meeting halls and religious establishments to make a speech, in the classroom to give lectures, or in restaurants to keep reservations and waiting lists handy. It includes eight screws and assembly tools so you can easily affix the base and reading surface, allowing you to stand up and let your ideas be heard in no time at all. HIGH-QUALITY, DURABLE CONSTRUCTION. Expertly made with clear, ½-inch, acrylic plexiglass material to supply long-lasting strength and use, this lectern will provide long-term strength and use for years to come. Although acrylic is lightweight, it boasts great strength and is even shatter-resistant. If you feel that you need pound your fist to make a point, feel free to do so. SLEEK, CONTEMPORARY DESIGN. Easy to incorporate into any existing decor, the sleek, swept-back modern design suggests presenters are in tune with the times regardless of the venue or topic. Additionally, the large, 26-inch base features four rubber feet to protect any flooring surface from scratches and scuff marks. PROFESSIONAL LOOK. Standing 47 inches tall with a generous, slanted presentation surface measuring 26.8 inches in width, this sleek podium will deliver a professional look wherever it's used. The reading surface is equipped with a lip on the bottom to prevent papers and books from sliding, while a built-in, backed beverage and note shelf allows you to refresh yourself or your memory. MULTI-PURPOSE PODIUM. 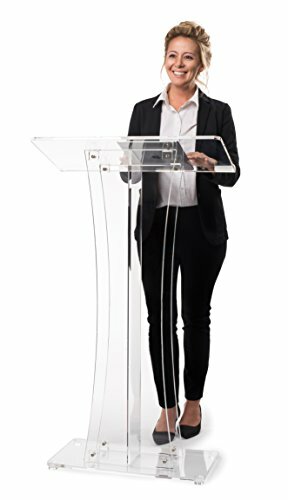 Adding style and pizzazz to any presentation, this lectern can be used in conference rooms, meeting halls and religious establishments to make a speech, in the classroom to give lectures, or in restaurants to keep reservations and waiting lists handy. EASY ASSEMBLY. This podium comes complete with included hardware for quick and easy installation. Simple to assemble with eight provided screws and assembly tools, you can easily affix the base and reading surface in no time at all. Fixture Displays Birch Wood Podium, Pulpit, Floor-standing Lectern for School, Church, Business, Speech, 41.5" Height 119807!